We love this new cyclamineus-type daffodil for its form and flair, not to mention its vivid color and vigorous growth habit. 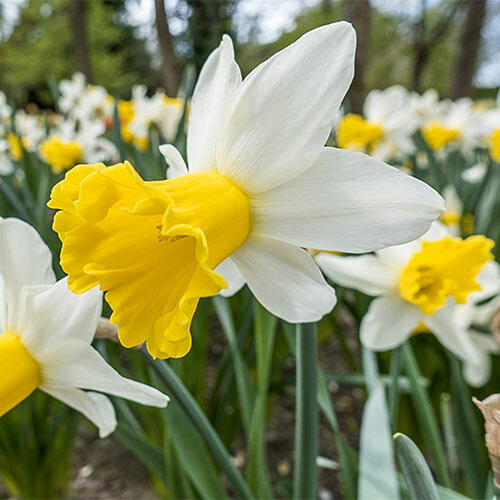 Long, funnel-shaped trumpets of bright yellow are encircled by pale yellow petals that mature to shimmering, snowy white in early to mid spring. The breathtaking blooms sit atop 12" tall stems, making them ideal for front borders and container gardens. They also make a fine addition to cutting gardens where they can be admired outdoors as well as in fresh floral arrangements. Like its contemporaries, Wisley naturalizes like a dream, popping up year after year with even more bloom and beauty. It has been named after one of the world most famous gardens owned by the Royal Horticultural Society (RHS) in the UK. The fact that the RHS has approved the use of their name tells you that this is an exceptional daffodil! Like its father, Daffodil Peeping Tom, Wisley has a long, funnel-shaped, bright yellow trumpet with wavy, flared margins. Its curved petals open pale yellow and mature to glistening snow-white. Flowers are approx. 3.5" in diameter. 6" deep and 4 - 6" apart. Loosen soil about 10" before planting and water well after planting.